$149.95 $199.99	Get Your Stuff! 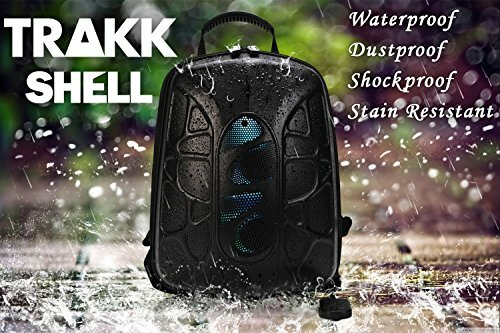 POWERFUL / LOUD / STRONG SMART BACKPACK: The TRAKK SHELL waterproof backpack and laptop case contains a 20W output (5WX2) subwoofer with max-bass technology. The SHELL can literally be heard through storms, wind, construction, and other loud settings. 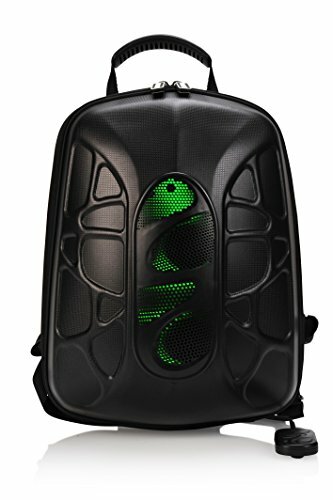 LED BACKPACK WITH POWER BANK & BATTERY LIFE: The SHELL includes an internal USB output power bank to charge all your USB enabled devices: smartphones, tablets, notebooks etc. The power bank is powered by a 5200 mAh battery and can complete charge our phone twice. The SHELL can provide up to 12 hours of audio on single charge. 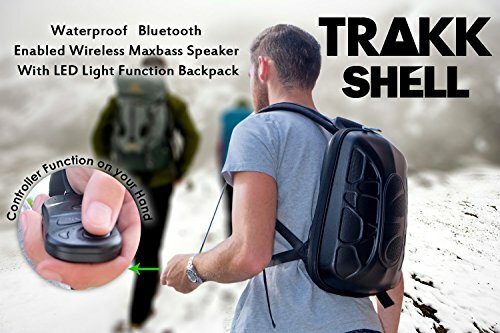 ADVANCED CONNECTIVITY & COMPATIBILITY OF A WATERPROOF HIKING BACKPACK: The SHELL backpack with speaker can be paired with your Bluetooth device up to 65 feet away. High Speed Bluetooth 4.0 Connectivity allows for auto pairing and high quality sound. 20W HI-FI Built in Bluetooth Speakers are compatible with Smartphones, Tablets, MP3 Players, and other audio devices. RUGGED DESIGN AND DURABLE MATERIAL: The SHELL waterproof backpack contains a hard-shell material to provide protection for all your gadgets and belongings no matter the adventure. Multiple compartments in the backpack provide enough storage space for your accessories, clothing, food and more. Rugged design allows for complete durability. EVA Manufactured materials allows for complete shockproof protection. RISK FREE: All TRAKK Products include a 1 Year Warranty and full satisfaction guarantee. The TRAKK Shell Bluetooth Speaker Backpack (Buy) is perfect for people who like to listen to music with friends. Now, when I grew up, we all had Boom Boxes (yes, I’m old, I know) so it was easy. These days, however, everyone has headphones or earbuds. They’re great but, unless you remember to carry an external speaker around or listen to the crappy speaker in your cell phone, it’s hard to share music with friends and listening to music while you play a game of hoops is just not going to happen. 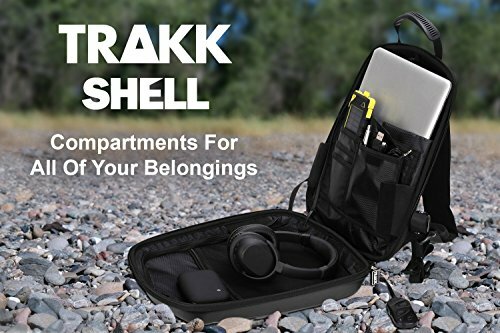 That’s where the TRAKK Shell Bluetooth Speaker Backpack comes in. Basically, it’s a 20w speaker system with a 5,200 mAh battery pack mounted in a smallish hard-shell backpack. You connect to the speakers from your phone via Bluetooth from up to 65 feet (20m) away. It even has LED lights that sync up with your music which is pretty cool! It’s perfect for beach parties or tailgating events since you don’t have to stay close to it to keep the music playing. Oh, and since it’s water-resistant (they actually say water-proof but, I wouldn’t dunk it in the pool) you don’t have to worry about snow or rain ruining your speakers or the other contents of the pack. Why yes, that does mean you could blast tunes while snowboarding down a mountain in fresh powder. 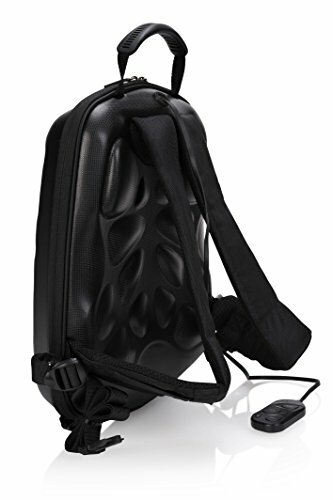 To help control the music and LED lights, there’s a convenient controller box attached to the strap of the backpack. 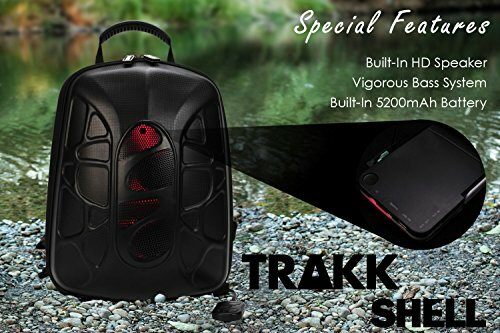 The TRAKK Shell Bluetooth Speaker Backpack has a USB charging port to keep your phone’s battery topped off. In addition, unlike your new iPhone, there’s even an Aux port to connect to other devices. Oh, I almost forgot. It has a TFCard slot so you can play your music directly from the backpack (as mp3 files). No need for a Bluetooth connection. All in all, it’s a pretty awesome way to listen to your music AND carry your stuff. Dimensions: 11.8 x 6.3 x 15.7 inches. Memory Card Support: TF card (Max.32G, mp3/wma/wav files). Ports: AUX port, USB port, TFCard slot. 5200mAh internal USB Output Power Bank provides full power for long trips and adventures. Hard-shell Material provides protection for all your gadgets and belongings no matter the scavenger. Smart LED Safety Warning Light synced with your tunes!